Less than Half Price Sale! You are looking at a work of art. 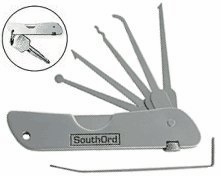 This is the worlds finest jackknife pick set. It looks like a small pocket knife. It has a machined aluminum handle that is only 3-1/2" long and 1/4" thick. It holds 5 picks and a tension tool inside the handle. This unit is fully self contained and is a must for anyone who has been locked out at one time or another. It fits on a key ring, which is the perfect place in case of emergencies. Patents Pending.